STEUBENVILLE — Jerry Barilla looked at the nearly empty showroom in his North Fourth Street store and lowered his head. The decision to close Frank and Jerry’s Furniture and Appliance Store was made several months ago but it still has been difficult for Barilla, who has worked in the business since he was a student at Steubenville High School. 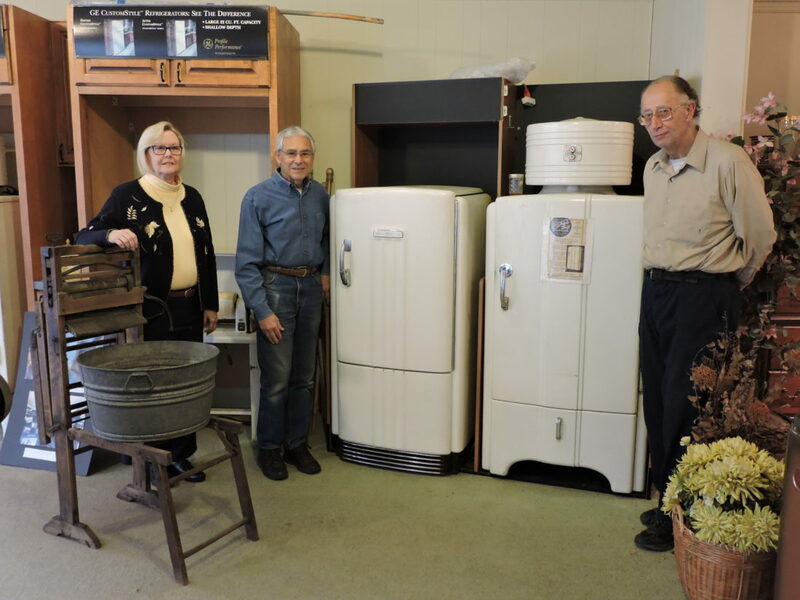 “My dad was the appliance manager at the old Fort Steuben Hardware store. Then in 1957 he went into business himself and called it Frank’s Appliance store. He was located at 122 N. Fifth St. between the Hub Department store and the Paramount Theater. His brother John was the service manager for the store and my mother Mary served as the office manager,” related Jerry. “I was 16 years old when I started working at my dad’s store Tuesday and Thursday nights and on Saturdays. My job was to help deliver the appliances and make sales to customers in the store. After I graduated from high school I went to Kent State University where I got a degree in education and I began my teaching career at Grant Junior High School in 1965. I stayed there four years and I continued working part-time at the store,” continued Barilla. “In those days I had an hour long lunch break at Grant school so I would walk down to my dad’s store and we went to lunch at either the Wheel Restaurant or the Hub Tea Room. That is where I met my wife Judy. She worked in the lady sports attire department below the tea room and I would smile at her and finally asked her out one day,” laughed Barilla. “By 1969, I quit teaching and started working full time at the store because my parents were getting older and I felt obligated to help them and maintain the business. We had to move from our location on North Fifth Street to 159 N. Fourth St. in 1969 because the Hub had bought our building and the Paramount to create a parking lot for the store. More and more people were driving cars and parking was at a premium,” recalled Barilla. “That is when my father added my name to the business along with furniture and we became Frank and Jerry’s Appliance and Furniture store,” added Barilla. “Then in 1979, Home Furniture, which was owned by Ben Bushman, was closing its Steubenville store and the building we are currently in became available for sale. This building had three floors, a basement and an elevator. We had appliances on the main showroom floor, living room furniture on the second floor and the third floor was all bedding and some kitchen furniture in the basement. We also sold Lawn Boy lawn mowers,” related Barilla. “Our competition was the Hub, M&M Hardware store, Fort Steuben Appliance, Sears and some smaller businesses. In those days you were more exclusive with a brand name. We sold Whirlpool appliances and customers felt some loyalty to a brand name. Sears became a game changer when they started selling different brands in their stores,” remarked Barilla. “I had taught Terry Papola at Grant School and my father later persuaded him to leave his job at Top Value Furniture to come work for us. My dad basically stole him from Harry Sigusmund. I can tell you our success as a business came about because of Terry and other people who worked with us. My dad’s slogan was, ‘After the sale it is the service that counts’ and that was the key. When your name is on the door it is important to provide quality service to your customers. You have to have good people for that service. After my Uncle John died we had two different contractors who handled our service, but one man died and the other had to quit in recent months because he had a bad back. We also had Joe Vein who has been with us for years. He assists Terry and does the appliance installation for us,” explained Barilla. “The decrease in service people and the lack of people willing to deliver refrigerators, washing machines and dryers to homes and businesses was part of the reason for closing down our business. And we were using our personal money to keep the business open and that is not a good decision,” stated Barilla. “So we listed the 120-year-old building with Cain Realty and we have about nine items left for sale. I plan to take the old refrigerators and washing machines to the antique store on Market Street. We will still be here having our morning coffee meetings until the building is sold. I still have customers come in looking for parts for their appliances. And when people come in and ask me where they can shop for an appliance or a piece of furniture I refer them to Hauser’s or M&M Hardware or Alco’s in Follansbee. And Lowe’s also serves a role in today’s market. Plus you have U.S. Route 22 that goes straight to Robinson Township” said Barilla. “My wife and I have been involved with the Historic Fort Steuben for the past 15 years so we will have more time to work there. I threw my hat in the ring in the city’s mayor’s race and will be focused on that in the coming months,” said Barilla. ” I plan on taking it easy and I will also continue volunteering at the fort,” said Papola. When the Sears store at the Fort Steuben Mall was closed last year, Barilla’s immediate reaction was to wish he was younger. “If I was 20 years younger I would go out and buy all the appliances I could find because the market is getting smaller. But I can’t do that any longer,” he said. “This has been my life for so long I have a sense responsibility to stay open for the customers. But when you lose money year after year you just can’t continue. We will be here until we sell the remaining items or until the building is sold. Then we will lock the doors. It has been a good run for the past 60 years,” Barilla said quietly.